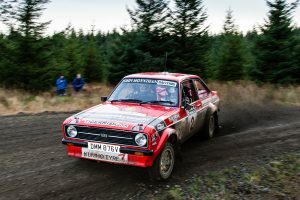 Success in so challenging a competition was particularly sweet for the Co. Derry-born driver, as a roll in Ypres back in June had robbed him of an almost certain podium place in this year’s British Rally Championship, in which he nevertheless achieved three podium finishes. 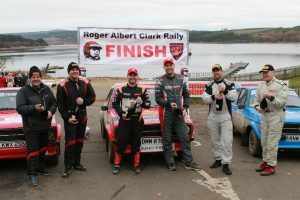 Quaffing the victor’s champagne just two days shy of his 32nd birthday, he was quick to praise his co-driver Barney Mitchell, his service crew that made no less than two clutch and gearbox changes, and Kumho Tyre, whose R800 gravel rally tyres kept him on track throughout the gruelling 300 miles of special stages. Held in honour of the late but fondly remembered Roger Clark MBE and designed to reflect the tough RAC international rallies of the 1970s/1980s, the event was fought out over four exhausting days and no less than 30 special stages that took the crews and their pre-1982 cars from the start at Shelsley Walsh hillclimb through Wales, the North of England and into Scotland before finishing alongside the Kielder reservoir. 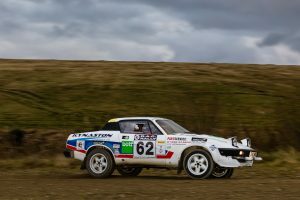 McCormack wasn’t the only driver making the most of his R800 gravel tyres on the rally, and regular Kumho runner David Kynaston and his co-driver Val Thompson were victors of class D4 aboard their Triumph TR7 V8.